Fossils can be found in Limestones you gather by digging up rocks. 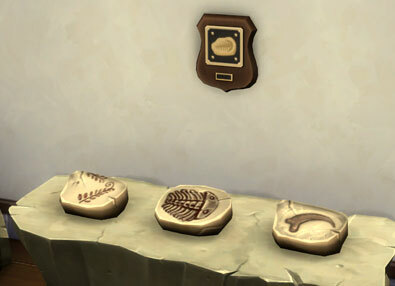 You can find these rocks in different worlds in The Sims 4. The chance of getting a Limestone is completely random as are the Fossils you are extracting. When your Sim has reached level 5 Logic Skill you can collect samples of the fossils using the Microscope. This will give you a Microscope Print to hang on the wall and add to your Microscope Print Collection. Your Sim can also ‘study fossils‘ to get them Focused. Start searching and collect all 15! When you are digging up rocks there is a chance that you will find Limestones. Collect the Limestones so you can extract the Fossils from these stones. When extracting Limestones there is a chance that the Fossil will break, that will give you an Broken Fossil and is only worth §10. You can also find them by ‘Exploring Space‘ with a Rocket Ship. You can also unlock all the Fossils with the Buy Debug mode cheat (adds extra objects) found on the Cheat Code page. Make sure you put the Fossils in your inventory to complete the collection. This gift from the Simsonian Museum Paleontology Department quietly congratulates you on your veritable fossil collection. It comes with a note saying that they aren’t the very least bit jealous. Most definitely not.